This book provides an in-depth description of the ways solar power has been used for at least 2,000 years. 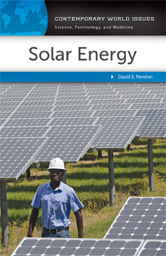 It outlines how humankind has utilized various forms of energy from the sun by way of photovoltaic cells, concentrating or focusing solar power, active and passive solar heating, and other mechanisms; and provides perspectives on today's solar energy issues from a variety of subject experts. An Age of Solar Power?